Vietnamese Prime Minister (PM) Nguyen Xuan Phuc yesterday had a meeting with representatives of press agencies and enterprises, who will cover the APEC event in the Governmental Office on the occasion of 92nd anniversary of Vietnam Revolutionary Journalism Day (June 21, 1925-2017). PM Phuc appreciated the important role of the media in the country’s innovation and development, and congratulated Vietnamese Journalists' Association, staffs and journalists from over 800 nationwide press agencies on Vietnam Revolutionary Journalism Day. He highly appreciated proposals of Vietnamese Journalists' Association about building topical subject for the APEC 2017, and suggested the association and the Governmental Office to jointly organize this event annually. Vietnamese Party and State always respect role of media, create the best favorable conditions for the press agencies to complete well its mission, and believed that press agencies and enterprises continue accompanying in integration and development of the country. In paralleled, the two sides need to actively fight against negative phenomena, private and group interests, anti-corruption and anti-waste, suggested PM Phuc. The media agencies must actively share ideas of economic experts, timely analyze socio- economic conjunctures, and join hand with the enterprises to build and develop culture of business and Vietnamese people, honor outstanding people in the community. 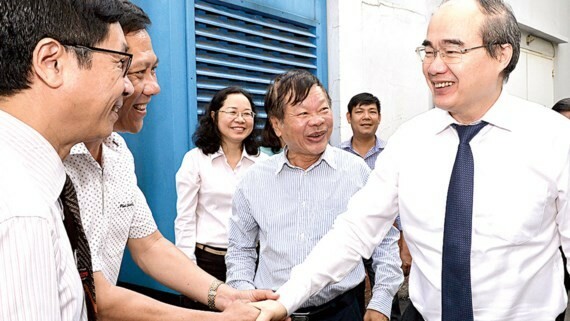 At the meeting, Chairman of Vietnamese Journalists’ Association Thuan Huu introduced to the prime minister about some practical activities of the association in previous time. The APEC 2017 is a chance to advertise the country and image of Vietnam, and connect between enterprises in the country and members of Asia-Pacific region. On the same day, Chairman of Vietnam Fatherland Front Committee and Secretary of Ho Chi Minh City People’s Committee Mr. Nguyen Thien Nhan and leaders of HCMC Party Committee visited and congratulated the editorial boards, staffs and journalists of Vietnam Television Center in HCMC (VTV9), Voice of Ho Chi Minh City People, Tuoi Tre Newspaper, website of HCMC Party Committee on the Vietnam Revolutionary Journalism Day. The City’s Party chief congratulated multi- faceted development of the press agencies, and highly appreciated the companion for the city’s development.